Retired Air Force Gen. Gregory S. Martin speaks about innovation and the Third U.S. Offset Strategy Aug. 24, 2016, in the base theater. Innovation and the Third U.S. 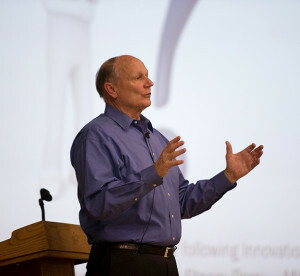 Offset Strategy were the topics brought forth by retired Air Force Gen. Gregory S. Martin, who spoke to members of Team Edwards Aug. 24 in the base theater. 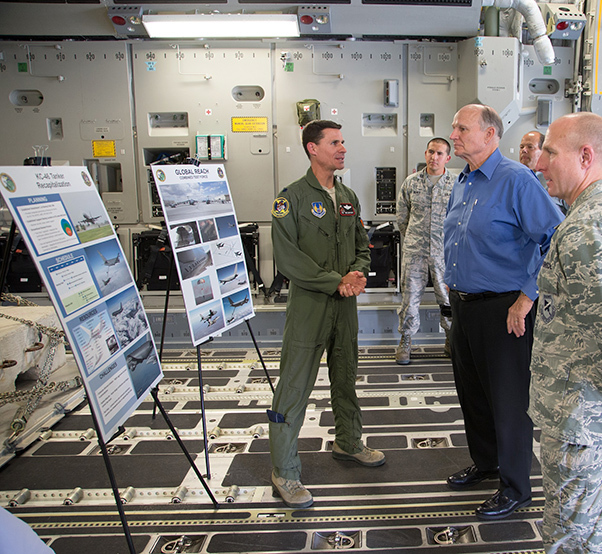 The 412th Test Wing at Edwards Air Force Base, Calif., and its innovation team have been encouraging new ideas and processes to pave the way for the future in test and to improve efficiency in general. To help with that encouragement, the wing invited Martin to meet with the 412th TW Innovation Team and speak to the Edwards workforce. Martin retired from the Air Force in 2005 as commander of Air Force Materiel Command after serving 35 years on active duty. He has become an independent consultant and serves on several aerospace industry advisory boards. He also has served as a mentor to the joint staff of the DOD. Innovation and change are intertwined and Martin gave some insight on how to develop an innovation culture. The biggest part is to have the right mindset, he said. Innovation in technology is key to Defense Secretary Ash Carter’s Third Offset Strategy. Martin said Carter acknowledges that America’s smaller force needs to be much more capable and superior to enemies America is likely to face who have more quantity. The DOD is focusing on modernization and three world theaters – Europe, the Middle East and Far East. The first offset began in the 1950s and gave America a significant lead in the world by building up its nuclear arsenal as a deterrent. This lasted until the early 70s. Toward the end of the Vietnam War and into the 80s, DOD knew that in a conventional war it had to be able to penetrate enemy airspace and deliver weapons more precisely to destroy enemy forces without nuclear weapons. This became the second offset. “So precision and stealth became very important and gave us an advantage that we used very well through Desert Storm,” Martin said. 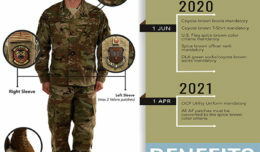 According to Martin, today, DOD is focused on seven operational areas of modernization and improvement: anti-access/aerial denial; guided munitions; undersea warfare; cyber and electronic warfare; human-to-machine interface and teaming; war-gaming and operational concept development; and supporting its defense innovation unit. Retired Air Force Gen. Gregory S. Martin is given a briefing by Lt. Col. Eric Bippert (left), 418th Flight Test Squadron commander, on Edwards AFB’s KC-46 tanker efforts and Global Reach Combined Test Force test programs. He said research shows that there are five game-changing technologies – directed energy, hypersonics, autonomous vehicles, remotely-piloted aircraft and nanotechnology. “Let’s suppose we take those game changers and those seven operational activities, and apply those to problems we face with our threats. You’ll have sensors that will give you full-spectrum knowledge of the battle space. You’ll have materials that are immune to heat decay while offering transmission and reception capability just by virtue of their fiber and makeup instead of special antennas. You’ll have energetics that will provide unimaginable velocity on both manned and unmanned systems. You’d have weapons that can travel the speed of light. In short, you’d have forces that would be nearly invulnerable to the defenses as we know them today. That’s what your bosses are thinking about, and that’s what you need to be thinking about. Here at Edwards Air Force Base, how do you and how can you contribute to that business? Martin also said the Air Force has developed a lot of technology, but as a result of good ideas, necessity and funding; not necessary by having a culture of innovation. He told the story of a captain who told his major general that he thought they could harness the accuracy and timing of the GPS and apply it to a tail kit on a “dumb bomb” and accurately deliver it. The idea was passed up the chain and funded by Air Force Systems Command. Another idea Marin reflected on was when he was AFMC commander and had to write letters to family members of AFMC members who died for whatever reason. 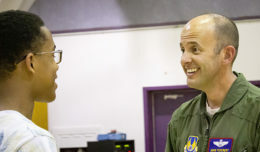 Since the majority of AFMC is civilian, he got approval from the chief of staff to allow civilians to participate in the Air Force three-day per week physical fitness program. Martin wrapped up the talk by asking everyone to maintain an intellectual curiosity to promote ideas and possibly make the Air Force better in the future. Those on Team Edwards who have an innovative idea can submit it through their unit command or email theodore.wuth@us.af.mil, or christopher.nagel.1@us.af.mil.